The fastest animal in the world was charging towards me. Her dark brown eyes were focused on the prey. She swooped just above my head and I caught a glance of her hooked bill and sharp talons; ideally suited for ripping apart a meal. She had no interest in me and went straight for the outstreached glove of the falconer and a morsel of meat. The Peregrine Falcon can reach over 240 mph when it enters a hunting dive. The fastest speed of any animal on our planet. 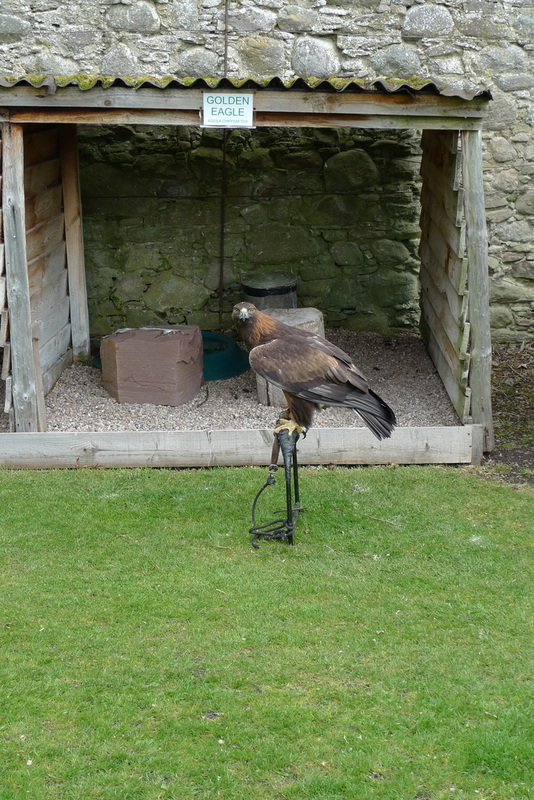 This was one of several birds that I learned about during the falconry display at Dunrobin Castle. "When she's finished eating that I've got another one here 'cause of the 2-for-1 rule she invented," the flat-capped falconer joked with the audience. "They are in charge, the birds." ​He explained that the birds are trained to catch something bigger than them so they cannot fly away with it. The Falcon is trained to catch geese and ignores everything else that it would normally go for, like songbirds and pigeons. I had wanted to visit Dunrobin Castle, the ancestral home of the Dukes of Sutherland, for many years. Not to see the birds of prey, nor its fairytail turrets or even the sycamore lined library of 10,000 books. No, I wanted to come here because the castle has its own train station. I had dreamed of taking this journey ever since I discovered the timetable for the Far North railway has Dunrobin Castle as its fifteenth stop. This had intrigued me for years; surely there could be nothing finer than boarding a train at Edinburgh and travelling most of the day to arrive onto the platform of this Highland idyll? But I wanted my journey to be more of an adventure than a train ride. I wanted to feel the wind in my face, smell the Heather and taste the rain drops. This is why I had spent the night in a converted railway carriage at Rogart and then set off on the single track Golspie Burn Road. I was coming in the back door, the lesser-known approach to Dunrobin. 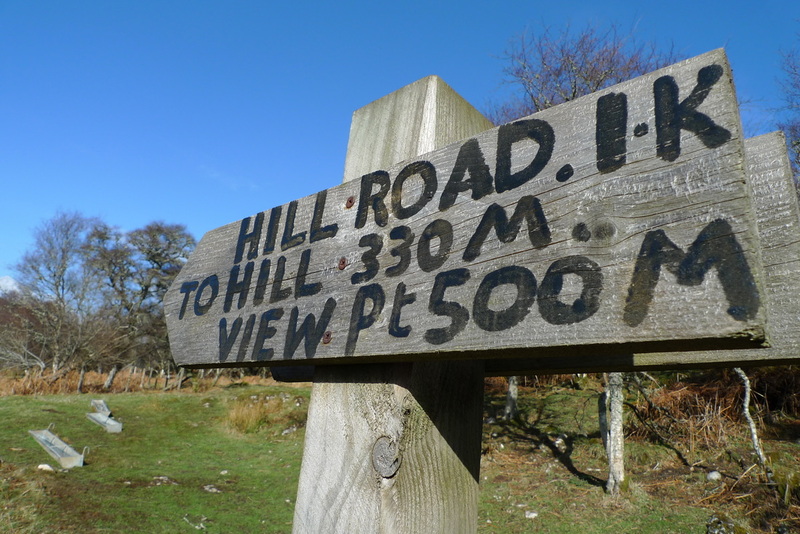 At the top of the steep hill leaving Rogart I spotted a wooden sign, hand-written in black paint, for a viewpoint walk. Things like this I find hard to ignore. The chance to see something new, to trod where I have never trod before. The path took me through a forest with a carpet of spongy and springy moss and a chorus of songbirds. At the top there is a rickety bench from where I sat to enjoy a vista of hills parting to reveal a hint of the North Sea. The sea was the end point of my journey, the goal to aim for. In my mind I imagined the gate at the end of the castle garden- it opens onto a beach lapped by the North Sea. To get there I travelled through barren moorland where nothing stirred. I passed a single white cottage, all on its own, surrounded by hills of Heather. Who would live in such isolation? There was something appealing about having this all to yourself, but it was also foreboding, a harsh landscape, a place where nature could easily wreak havoc. Then the road curved and started to descend, revealing a valley with trees and patches of brown and yellow, hills rising on the other side. The sun blasted through the clouds. The bike rolled easily and I did not have to pedal. The road twisted left and right with straight stretches in between. It was more thrilling than a rollercoaster. It felt like somewhere that television advertisers come to film sweeping aerial shots of the latest luxury car negotiating curves amidst scenic splendour. I did not have to concentrate on anything but the view- there was not one other vehicle, bicycle or person to be seen. I had this all to myself and I didn't want it to end. It lasted for ages, perhaps one of the longest, sustained descents I have done on my bike. ​I felt like the man who has been in the wilderness for years and makes his bid for civilization, or at least the tearoom of Dunrobin Castle. Chocolate and raspberry cream sponge cake and an Earl Grey was my treat. The room was heated by a coal fire, despite it being warm and sunny outside, but the castle was cold. This always seems to be the case in these monumental buildings and I find that you often have to go outside to feel warmer. Above the fireplace there was a painting of Belasarius, one of the greatest generals of the Byzantine Empire. It is a sad picture as the general is depicted in a frail condition, blind and using his helmet as a begging bowl. This painting is one of many fascinating details to look out for inside the castle. I noticed the servant bells in the tearoom; they still function by means of miles and miles of brass wires under the floorboards. There is a 1920s cage lift that still works, but is never used because it does not have modern safety features. I marvelled at the bed that was especially made for Queen Victoria's visit in 1872. It has four columns, each topped with a carving of a dove. The doves are all different. This would have required much effort and expense, for the sake of a one night stay, when it would have been simpler to have all four doves identical. I wondered if the Queen had noticed. A visit from monarchy is a clear indicator of the status of the Duke of Sutherland. At one point he was the largest landowner in western Europe. For me the most visible sign of wealth and privilege is the countless hunting trophies. Stag heads decorate the main staircase and the Duke's study has rugs made from leopards and lions. The museum in the gardens is a story of taxidermy gone mad; a giraffe neck and head faced me as I entered. I found it unsettling to see all these creatures, lives cut short, but this is a product of its time. Now, Dunrobin celebrates the beauty of nature with the falconry displays. In the drawing room one of the castle guides said to me, "I saw you cycling. I passed you in the car." It got me thinking about how much I stuck out in this part of the country. I has seen no other cyclists. I was the only one. The guide also recommended that I went to the falconry display. She pointed out the window to the gardens, "the birds are magnificent, you should really go and seen them." 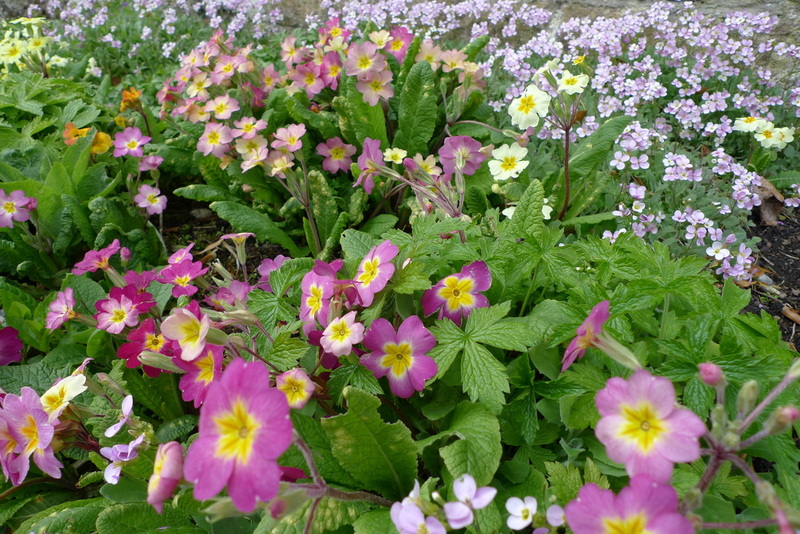 Sir Charles Barry, the designer of the Houses of Parliament, created the elegant gardens. 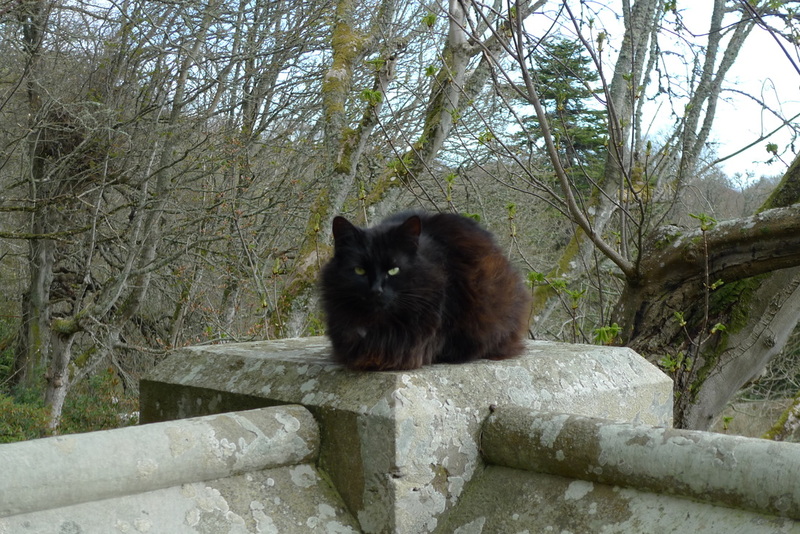 I followed a staircase, guarded by a black cat who stared right through me, to take a closer look at the pools, fountains, croquet lawn, woodland and orchard. They are not big gardens and do not take long to walk around, but they provide a photogenic foreground for the castle façade. It has the appearance of a French Château and it adorns countless postcards and tourist paraphernalia. The castle's north side is somewhat forgotten and rarely features on imagery, so I had no idea that it existed until I got here. It is no less impressive, with its clock tower and Renaissance styling, but it is totally different and if you put photos of the two side by side you would be forgiven for thinking them to be from two separate castles. ​Dunrobin Castle train station, still served by Scotrail services, is a five-minute walk away on the other side of the A-9. The staff in the gift shop had told me that the station building is rarely open. "There is a man who opens it up now and again. But we never know when. He just shows up." ​On this spring day the building was beautifully framed by an explosion of daffodils. It is built in English Arts and Crafts style with black timber frames and white walls. It has a Tudor quality and there is no other station like it in Scotland. A true one-off. When I looked up from under the canopy I noticed the remarkable decoration of interlinked tree branches. I peered through the windows and saw a wood panelled room crammed with railway memorabilia, mainly old station signs. The station exists because the Duke of Sutherland created this railway line so that he could link his castle to the mainline. When the Queen came on that trip that involved the special bed with the carved doves she arrived by train. The locomotive driver was none other than the Duke himself! He clearly loved trains. And I loved this station. I could have taken the train to this station and fulfilled my dream, but it would not have been as much of an adventure as cycling the Golspie Burn Road. I would have missed out on the tranquility, the empty roads, the scent of Heather, the incredible views and the fast descent through the hills. Yes, I made the right choice. The train from Inverness to Rogart takes around 2 hours. Services on this route are infrequent with four trains per day, less on Sundays. Rogart is a request stop which means the train will not stop unless you advise the guard in advance that you wish to get off. Or you can travel to Dunrobin Castle station, which is 2 stops after Rogart and a 5 minute walk from the castle. Dunrobin Castle station is also a request stop. It has a low platform, so could be tricky to get a bicycle on and off the train. There are steep plastic steps on the platform that the train lines up with, but I think these will be difficult to negotiate with a bike, so I recommend using Golspie station, which is less than 4km away. The route from Rogart station, via the Golspie Burn Road, to Dunrobin Castle is 20km. It is a single-track road with passing places. There is hardly any traffic and you will have much of it to yourself, so this really is perfect cycling. There are some uphills with the climb out of Rogart being the steepest. There is a short stretch on the A9 to get to the castle and if you are using Golspie station it means you will be on the A9 for a bit longer. This is a busy road with fast moving traffic. Some parts of the road are nice and wide, so there is plenty of space for safe overtaking, but some parts are narrower. If you are nervous in traffic I would not recommend using the A9, so you may wish to go back the way you came which is longer, but no bad thing considering how beautiful Strath Brora is. The traffic on the A9 can be lighter at certain times of the day such as early evening, so you could try to time your ride on this basis. Dunrobin Castle has paid admission. Spend the night on a bunkbed in old railway carriages at Sleeperzz, behind Rogart station. The carriages are named after single malt whiskies. You can also stay in a 1930s fairground showman's wagon or a Bedford bus. This is classed as hostel accommodation so the prices are very reasonable. I have written about Sleeperzzz in my blog. There is also a review of Sleeperzzz on the Indenpendent website. You will not find any tearooms or cafes along the Golspie Burn Road, which is part of the attraction of the area. The Pittentrail Inn is a two-minute walk from Sleeperzz and serves bar meals, but it is worth checking in advance if they will be open during your visit. Golspie is the place to go for supplies if you are going to use the kitchen facilities at Sleeperzzz. The town has a good selection of shops, cafes, pubs and restaurants. 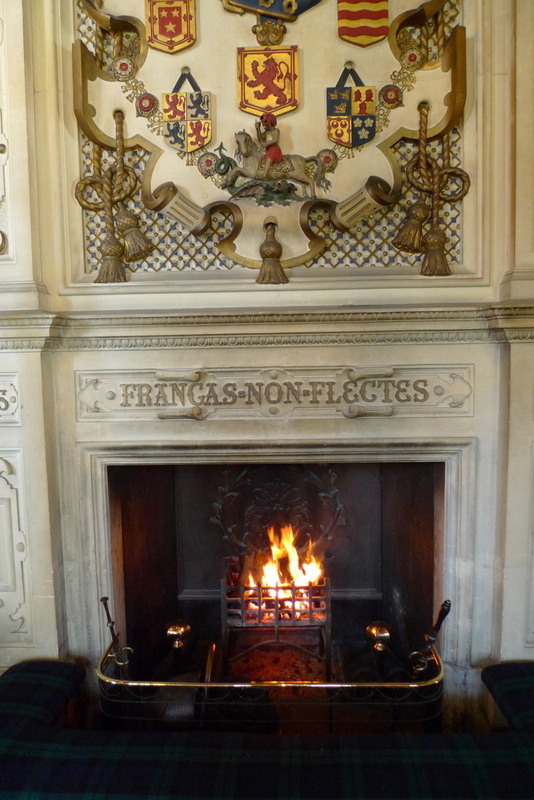 Dunrobin Castle has a tearoom with a coal fireplace.